What ingredients make for a great Aftermarket Salesperson? Yes, you are ready to invest in and expand your Aftermarket sales team. Congratulations! Many companies are realizing that staying connected to their customers and driving customer loyalty is the lifeblood to their entire organization. Not just for Aftermarket growth. Nope. We are talking organic growth of the entire organization. Staying connected with your customers has many requirements. Today we are just talking of one key ingredient…the dedicated Aftermarket sales professional. Once your original equipment has been sold and is operating for a customer, your organization wants to stay connected throughout the lifecycle of that asset. This is why you need a dedicated Aftermarket sales professional that helps deliver value to the end customer throughout that lifecycle to ensure the customers doesn’t drift away. Each and every day this dedicated employee thinks of how to show value to the customers in your Installed Base. If you stay connected…you get a much better chance of a repeat order for the next piece of equipment. First step. Ensure you invest in and hire for success. In this instance, a dedicated aftermarket sales professional is most likely both proactive in behavior as well as potentially a face-to-face salesperson. Moving from a reactive mode to a proactive mode is more than just a statement saying, “we are going to be proactive.” In order to be successful here at this change for your Aftermarket sales professionals, you need to hire for some key capabilities. I like to think of a 3-legged stool as an example to show the necessary capabilities. The stool won’t stand with just two legs obviously…so you need to have all 3 for success. The first and most critical capability to look for in your potential resource is sales capability. Each of us has their own opinion on sales training, but my point here is that the candidate must arrive at your doorstep with a successful track record in sales. Period. Yes, you can train for improvement, but in an Aftermarket world that has been reactive in prior era, this skillset may have been overlooked or deemed unnecessary for employees that helped deliver customer service. The next leg of the stool is the capability to articulate the value of your offerings to the customer. Remember we want to stay connected over the lifecycle of the asset. This means you will most likely have a varying set of offerings to show a different value proposition based on the diverse needs of your customer base. Finally comes a technical aptitude. This would be the last priority in my opinion in many cases depending upon the solution being sold. You can test for technical aptitude in many ways. In my experience, this is the one leg of the stool that is over-focused on when finding an Aftermarket salesperson…and usually at the cost of sales capability. Don’t fall into that trap. 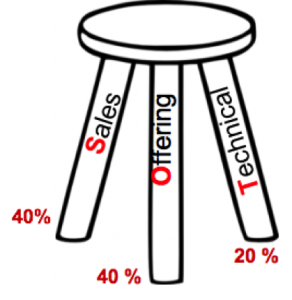 If you can use this analogy of the stool to focus on your new proactive and dedicated Aftermarket sales professionals, I think you can set the stage for success moving forward.